Last week, science writer Michael Shermer tweeted out this old xkcd comic strip that I had somehow missed before. 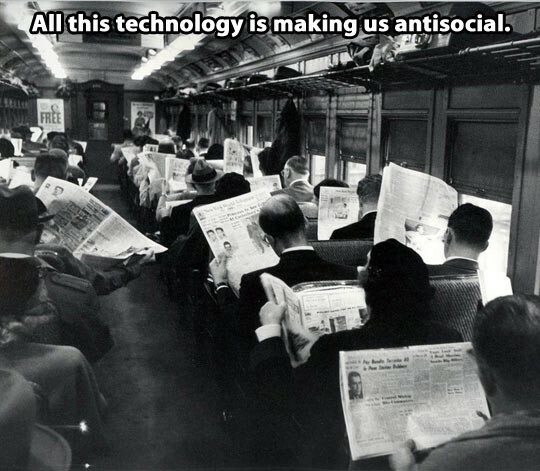 Shermer noted that it represented, “another reply to pessimists bemoaning modern technologies as soul-crushing and isolating.” Similarly, there’s this meme that has been making the rounds on Twitter and which jokes about how newspapers made us as antisocial in the past much as newer technologies supposedly do today. ‏The sentiments expressed by the comic and that image make it clear how people often tend to romanticize past technologies or fail to remember that many people expressed the same fears about them as critics do today about newer ones. I’ve written dozens of articles about “moral panics” and “techno-panics,” most of which are cataloged here. The common theme of those essays is that, when it comes to fears about innovations, there really is nothing new under the sun. Academics, social critics, religious leaders, politicians and even average parents tend to panic over the same problems time and time again. The only thing that changes is the particular medium or technology that is the object of their collective ire. Inattention was increasingly perceived as an obstacle to the socialisation of young people. Countering the habit of inattention among children and young people became the central concern of pedagogy in the 18th century […] During the 19th century, the state of inattention became thoroughly moralised. Inattentiveness was perceived as a threat to industrial progress, scientific advance and prosperity. Unlike in the 18th century when it was perceived as abnormal, today inattention is often presented as the normal state. The current era is frequently characterised as the Age of Distraction, and inattention is no longer depicted as a condition that afflicts a few. Nowadays, the erosion of humanity’s capacity for attention is portrayed as an existential problem, linked with the allegedly corrosive effects of digitally driven streams of information relentlessly flowing our way. While I generally agree these panics are overblown, one must also admit that there is some degree of truth to all of them in the sense that each new technology presents us with some added level of potential distraction. And today we have more of those potential distractions than ever before. So, something’s gotta give, right? “What information consumes is rather obvious,” Nobel Prize-winning economist and psychologist Herbert Simon remarked in 1971: “the attention of its recipients. Hence a wealth of information creates a poverty of attention, and a need to allocate that attention efficiently among the overabundance of information sources that might consume it.” Almost a half century later, we are confronted with a “wealth of information” that Simon could not have imagined, and that’s what has many critics worried about the potentially socially-destructive consequences of new technologies. And that was all pre-Facebook and pre-Twitter! A dozen years later, this isolation-is-killing-us theme is becoming even more prevalent in books and articles. There are far to many books of this ilk to list here, but a quick sampling of the most popular ones would include: Nick Carr (The Shallows), Franklin Foer (World Without Mind), Maggie Jackson (Distracted), Sherry Turkle (Alone Together), Eli Pariser (The Filter Bubble), John Freeman (The Tyranny of E-Mail), and Cass Sunstein (Republic.com), among many others. I have an entire bookshelf in my office filled with nothing but books of this variety, all penned over just the past 20 years. Perhaps the sheer volume of panicky tracts suggests that there must be something to these fears. Let’s be clear: isolation, distraction, or inattention are problems. But to some extent, these are problems that have always been with us and are not going away any time soon. Social critics and cranky intellectuals love to complain about new technologies, and that’s never going to end. The best of that criticism will incorporate practical strategies for living a better life and suggest steps for how we all can find a better balance with the technologies that dominate our lives–today, tomorrow, and on into the future. We’d all like to think that people–especially kids–were somehow more attentive, more social, and more civil in the past than they are in today’s seemingly more cluttered, cacophonous, hurly-burly modern era. But there is absolutely no concrete evidence suggesting that is true and, as Furedi shows, there exists plenty of anecdotal evidence that when it comes to inattention, things really haven’t changed that much at all. We can and should strive to do better and find constructive solutions to problems such as these, but we should not go overboard with rhetorical threat inflation about the nature or severity of this problem. Nor should we pursue impractical or highly destructive solutions that would undermine the many other benefits associated with our new technological capabilities. Ironically, at their very worst, isolation or inattention panics accomplish the exact opposite of what some social critics suggest that they desire. The critics often claim that they are just looking out for the next generation and trying to chart a better path for them. In reality, however, those critics are often just engaging in the same sort of fear-mongering and youth-shaming that countless other generations have before with their “KIDS THESE DAYS!” complaints. It’s always easy for intellectuals to tap into the worst fears of parents and policymakers by suggesting that the younger generation has lost the ability to reason or communicate effectively. 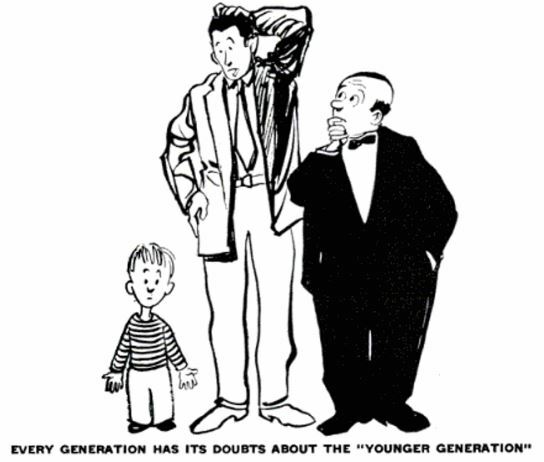 And yet, each generation somehow figures out how to muddle through. We are an imperfect species, but we are also a highly resilient one. Of course, that won’t stop an entirely new generation of critics from panicking about whatever future technology is apparently distracting the next generation to death. Fear sells and panics get attention. The calmer truths that history teaches us take longer to appreciate. Previous post: Does net neutrality increase online freedom?